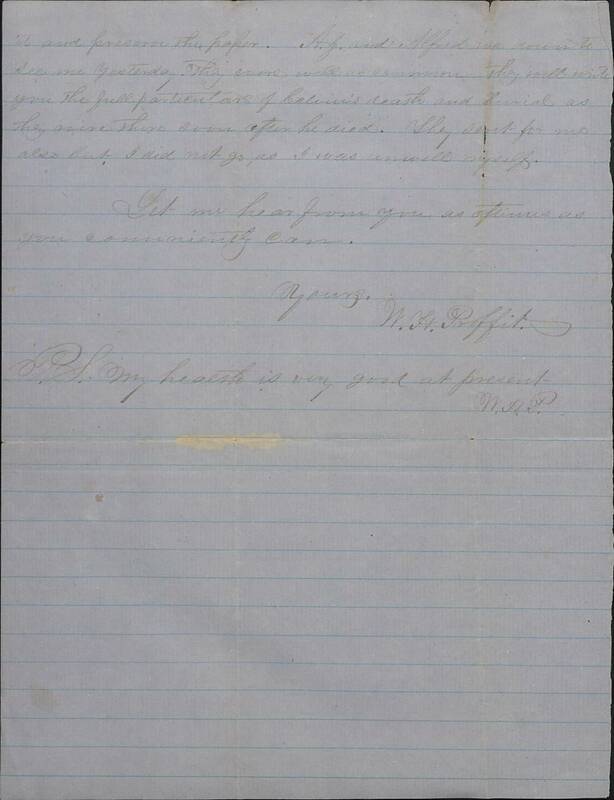 Item Description: Letter, dated 28 March 1863, from Corporal William H. Proffit during his service in the Wilkes Valley Guards (Company B, 1st North Carolina Regiment). In this letter Cpl. Proffit informs his family of the death of his brother, Calvin. From folder 2 in the Proffit Family Papers, Southern Historical Collection, Wilson Library, University of North Carolina at Chapel Hill. I drop you a few lines to give you the Sad news that brother Calvin is dead. He died about day break on the morning of the 25th inst. I suppose that the brain was affected which was the principle cause of his death. It is, indeed, an appauling thought to think of the death of one so dear, but sad as it is, we have some consolation to know that he remained usually pious while surrounded with all the vice and immorality of the camp, and instead of participating in this, devoted much of time in reading Scripture. Some of his companions expressed the thought that he was prepared to meet his God in peace. We have another consolation that he had won the confidence and esteem of his officers and fellow soldiers, and that every possible means was applied in burying him decently. A good coffin, clean clothes, etc. were provided. Sad as the thought is, it is no worse than thousands have endured since the commencement of this unholy war. I hope you will all try to refrain as much as possible from unnecessary grief, as it is a thing of no avail. “The Proffit brothers were very close, and the death of one, Calvin, was very hard for the others to bear. Calvin’s death was especially hard on Alfred, his twin brother. When a family member died, it seemed that only one person was appointed to report all of the particulars of the death. William concentrated on his brother’s good name among fellow soldiers and his Christian faith as facts to console his family with. William, who was now serving as a corporal, had to be very concerned as well, as he d had had several bouts with disease over the past month, despite his assurance at the end of the letter.” – Watford, C. M. (Ed.). (2003). 89. March 28, 1863. The Civil War in North Carolina, Vol. 2 (p. 102). Jefferson, NC: McFarland & Company, Inc., Publishers. All four Proffit brothers (Alfred, Andrew (A.J. ), Calvin, and William) served in North Carolina regiments in the Virginia theater of the war. William died in hospital at Gordonsville, Va., in October 1863. 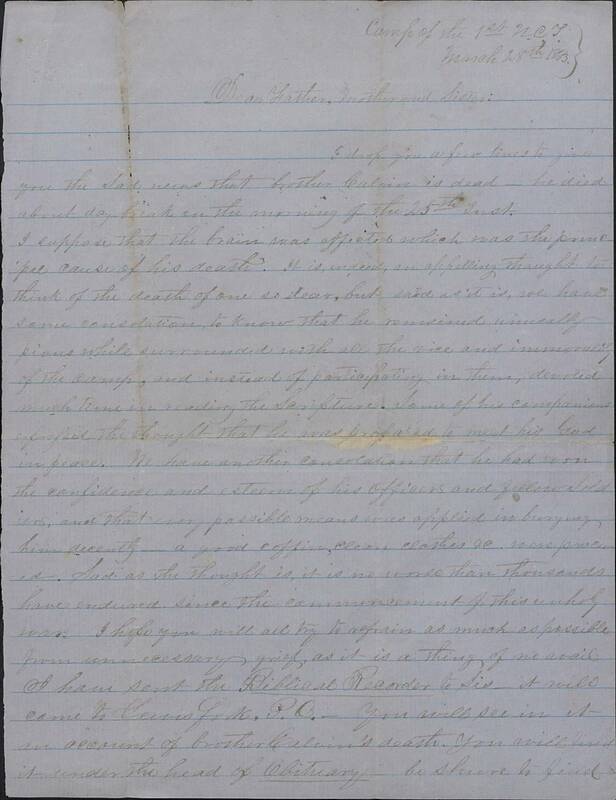 This entry was posted in Southern Historical Collection and tagged 1st North Carolina Regiment (CSA), camp life, death, disease, Lewis Fork, North Carolina, Proffit family, religion, William Proffit. Bookmark the permalink.